With countless A-listers from Eva Longoria to Charlize Theron often sporting a romantic, tousled Chignon for glitzy awards ceremonies, this feminine hairstyle has effortlessly made the transition from red carpet to become one of the most popular bridal up-dos. The perfect style for the bride who prefers soft, natural hair without the upkeep of wearing her hair down on her wedding day, the appeal of this bridal hairstyle is undoubtedly its versatility. The Chignon is quite literally a hairstyle chameleon with the ability to complement practically every bridal style and hair type. From loose and unstructured for a romantic, bohemian look to chicwaves with side sweeping fringe for 1940s Hollywood glamour, the Chignon has unique ability to look and feel effortless. Unlike tightly styled and set up-dos, most brides find the looser style of the Chignon much more comfortable to wear throughout her special day. 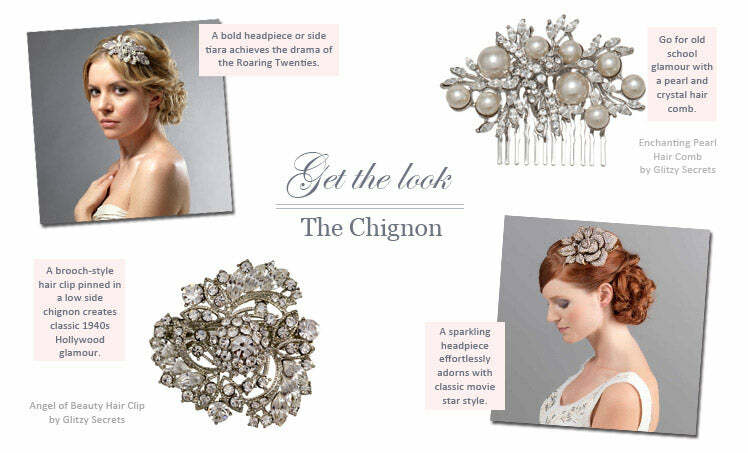 From a bejewelled hair comb set in a low side chignon, delicate hair pins scattered throughout the hair for subtle shimmer to a dramatic side tiara set in a 1940s style ‘do, this beautiful style lends itself to practically all types of wedding hair accessories. However, the key consideration is choosing an accessory to emphasise and complement your bridal style. A romantic hair flower adorning a loose, wavy centre-parted Chignon is the perfect choice for a relaxed Bohemian vibe and rustic country themed weddings. A bold headpiece worn at the side of the head in a Chignon styled in Marcel waves will accentuate the drama of the 1920s and fabulous Flapper style. For classic 1940s movie star style, a sparkling brooch-style hair clip set in a wavy side chignon nods towards the glamour of the Hollywood greats. Finer hair types opting for a loosely set chignon should remember to avoid heavier accessories which add unnecessary pull on the hair. • Have fine hair? Speak to your hairstylist about adding a few hair pieces to add thickness to your hair. • The Chignon requires lots of kirby pins or grips. Make sure they remain discreet by choosing a colour close to your natural hair colour. • If you have straight hair and are opting for a wavy Chignon, ask your stylist to recommend the best hairspray to keep your waves looking fabulous throughout the wedding day.